Fabio’s father owns a small farm in the near countryside where vegetables grow naturally gigantic. 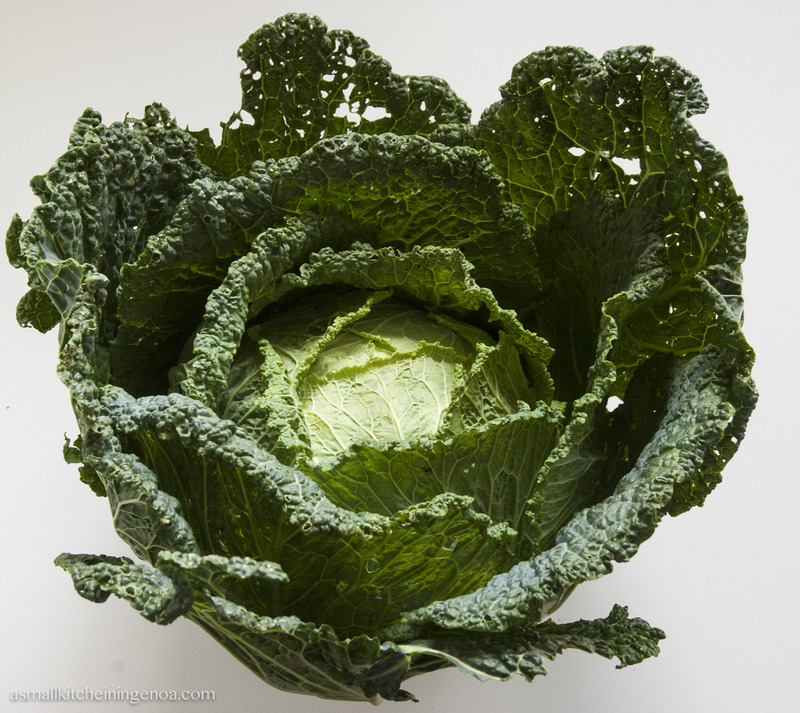 Yesterday a savoy cabbage slightly bigger than a basket ball entered my kitchen and landed in the terrace (hey, the fridge is too small for every one!). 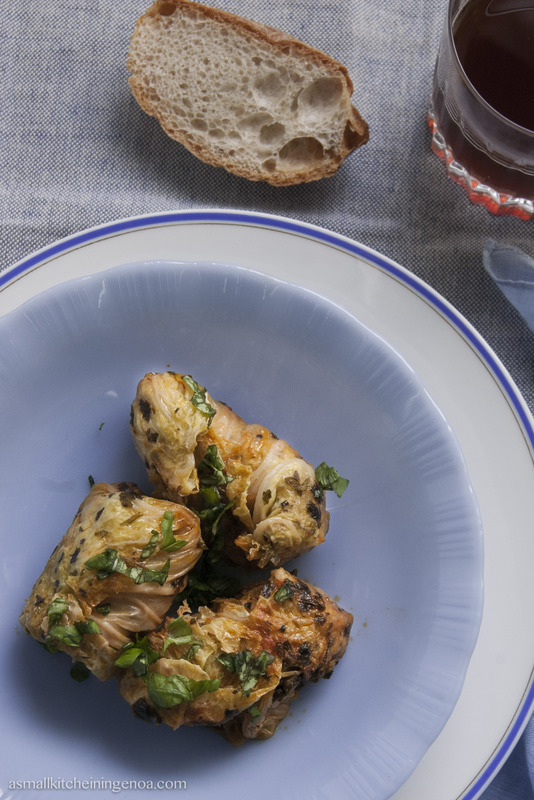 It would be a pity to waste that crunchy fragrant freshness, so today I take the opportunity to try out my delicious mom’s savoy cabbage rolls. This is definitely not a last minute recipe but indeed it is easy and the time and love you spend in the preparation make the result special. The taste is different, that’s it. 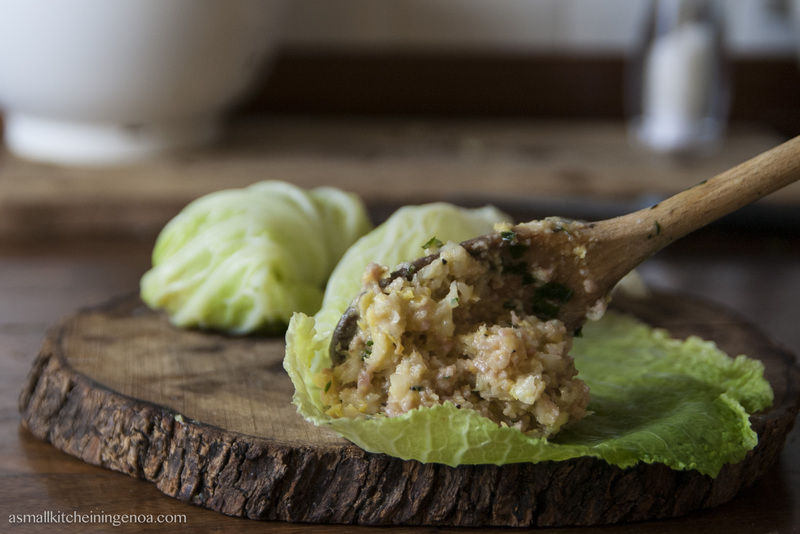 This is a typical winter/autumn recipe, as savoy cabbages naturally grow in this season. My mother uses to serve them with hot plain polenta or with boiled white rice seasoned just with butter and parmesan cheese. 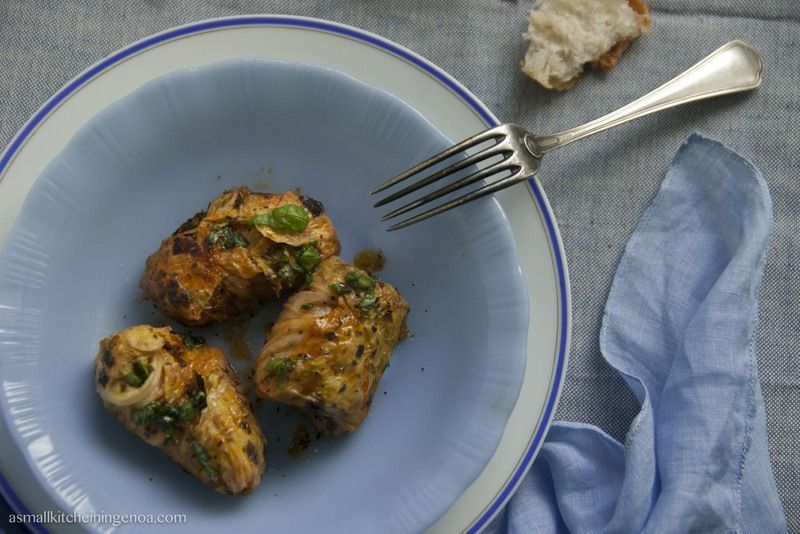 When you prepare them, unless you have to feed a crowd, you can put half of them in the freezer and take them out for a last minute – busy working day dinner. 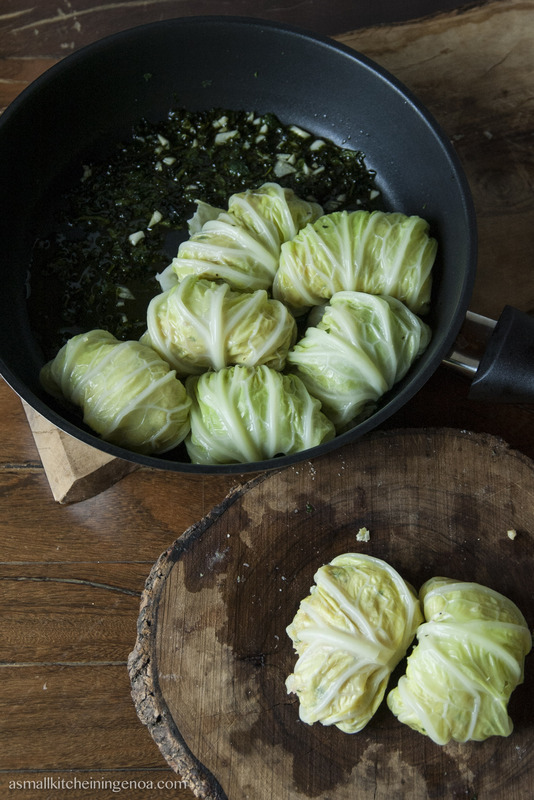 This recipe is for about 14-16 rolls depending on how big the cabbage is and how skilled you are in rolling the cabbage leaves without breaking them (I actually broke 2 leaves and lost hopelessly 4 rolls, sigh!). 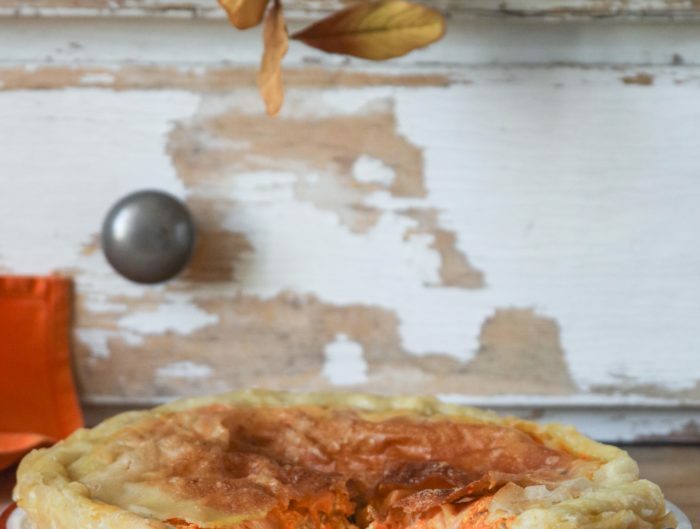 For a veggie version just skip the mortadella, the result will be tasty anyway! 1 thick slice of Mortadella (ab. 100 grams/3,5 onces) (you can use baked ham in place of Mortadella). 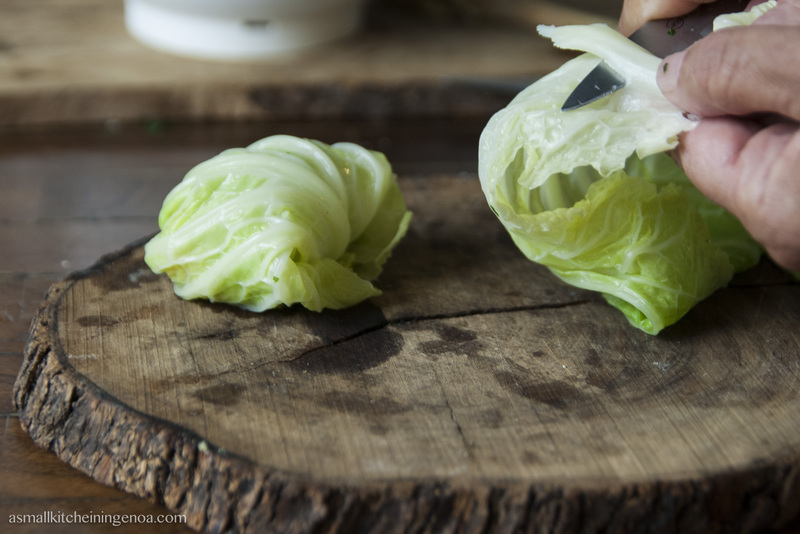 Leaf carefully the cabbage to obtain 10 intact leaves and boil them for 3 minutes (or until they soften) in a big boiling pan with slightly salted water (tip! :if you wish to keep the leaves bright green you can add ½ spoon of white flour in the boiling water). Pick the leaves up, always very carefully trying not to broke them, and put them to drain on a kitchen canvas. Chop the other vegetables (onion, carrot, celery and leek) and put them in a pan with 2 spoons of olive oil to brown for 5 minutes stirring often (tip! : If necessary add a spoon of water to avoid that they crust on the pan). 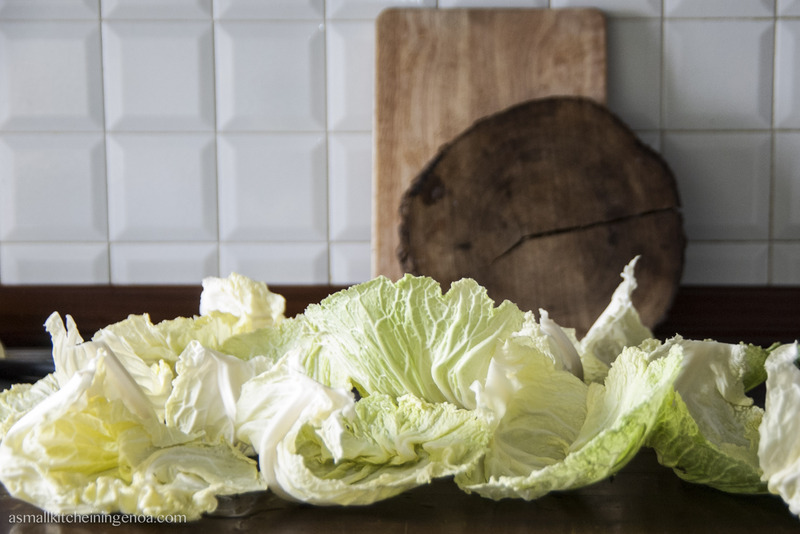 In the meantime put the rest of the savoy cabbage, cut in rough pieces, to boil in the very same water where you boiled the big leaves for ab. 5 minutes. Then drain the cabbage, dry it very well squeezing out all the water (tip! : as it burns when you keep it out from the pan I use to pass it through the fresh water of the tap before squeeze it) and chop it in small pieces. 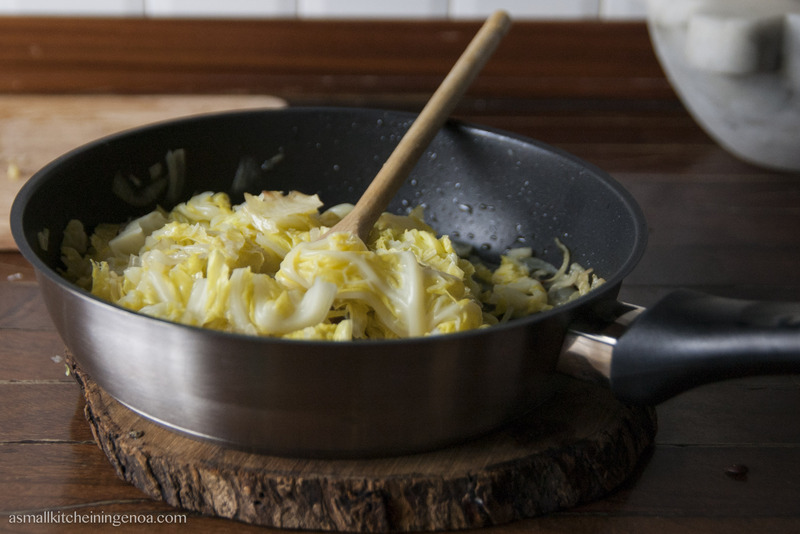 Add the chopped cabbage to the vegetables in the pan and let them cook together for 10 minutes more. Whilst the vegetables are stewing crumble Mortadella (or the baked ham) and the marjoram (or parsley). 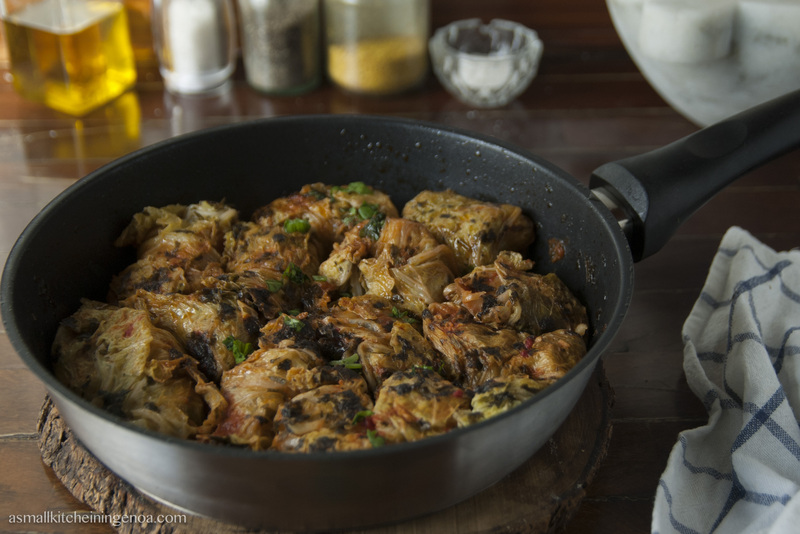 Put them in a big bowl jointly with the parmesan cheese, one egg and the already stewed vegetables. 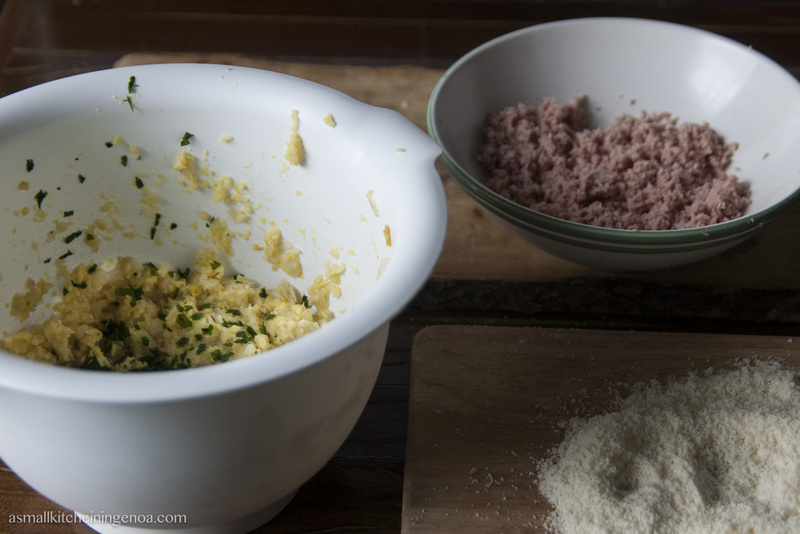 Mix everything together, add salt and pepper to taste. The filling of the rolls is now ready! (tip! 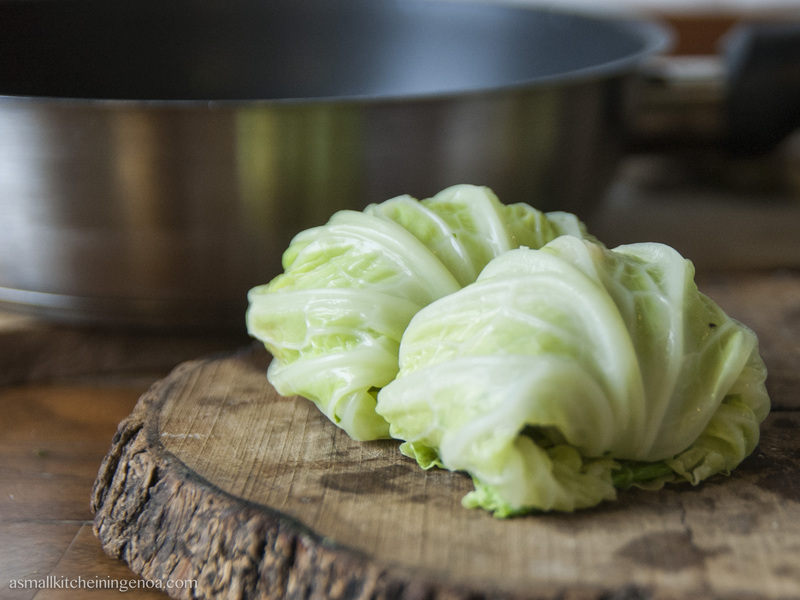 :be careful that the filling is solid enough to keep the shape when put on the cabbage leaves for being rolled. If it is too liquid add a couple of spoons of bread crumbs). Now it’s time to engage in rolling! Take a whole boiled leaf o the cabbage. Lay it open on the surface. Divide it in two pieces and cut off the central thickest part. Put at the center of one piece of leaf a spoon of filling and bend the borders like an envelope. Go ahead until the filling is over. 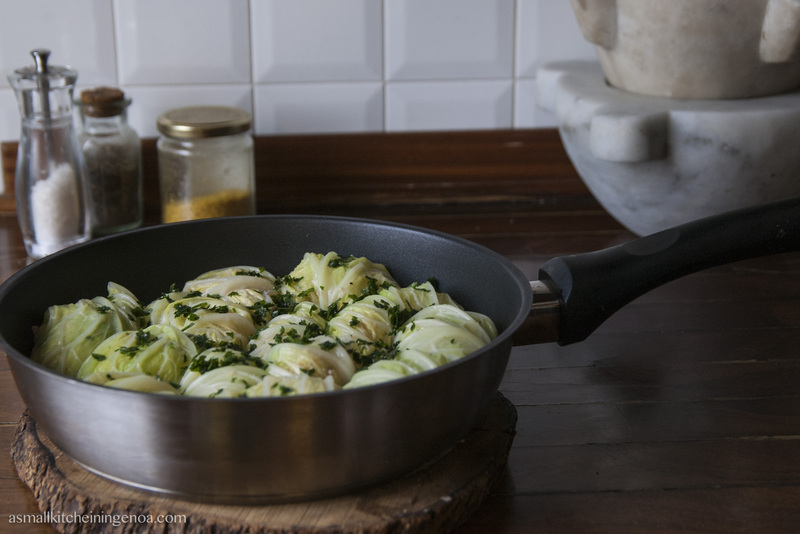 Put 4 tablespoons of olive oil in a skillet (use a skillet with a size fit for keeping all the rolls together close to each other, this will help them to support each other in order not to open during cooking), add the spoon of parsley left and a clove of garlic finely chopped and fry for 2 minutes. The oil will get flavored. 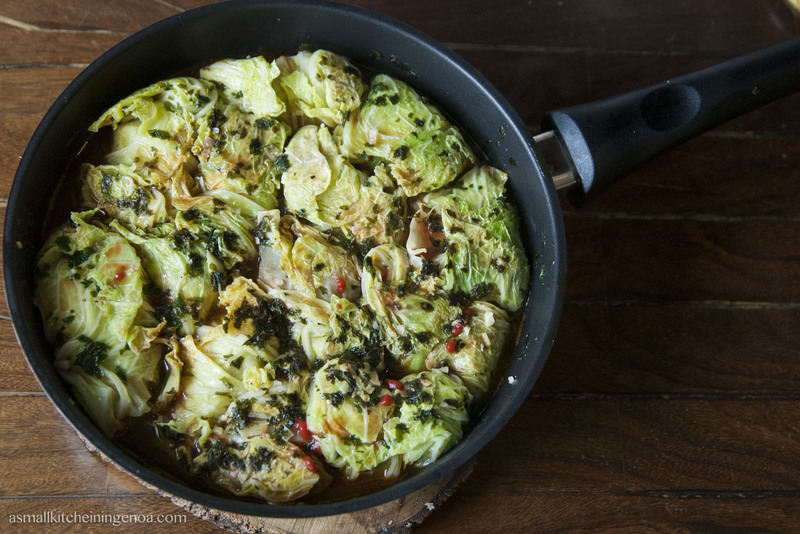 Place the cabbage rolls one close to the other in the skillet with the oil with the borders face to the skillet (also this will help to keep them close). Let them brown for 3 minutes (the eggs in the filling close to the skillet will cook, become solid and seal the rolls), then turn them and brown the other side for other 3 minutes (tip! : to turn the rolls I do in the same way as with the tortilla: I cover the rolls with a plate of the same size of the skillet, turn up side down the skillet and the plate together and lift the skillet . The rolls will remain upside down on the plate. I will then let them gently slide down from the plate in the skillet with the not jet cooked side on the hot surface). Prepare a light tomato broth by melting 1 spoon of tomato paste in 4 cups of vegetable broth. Pour the broth over the top of the rolls, cover and bring to boil. Then reduce the heat to low and let simmer for ab 20 minutes, gently basting with the liquid often. As the filling is made up of already cooked ingredients but for the eggs (which however have already mostly cooked during the precedent browning) the rolls are ready when the water of the broth is evaporated and remains a creamy tomato soup. Here below the photos taken during preparation, for a step by step guide! HI thanks for the recipe… I’m making this right now but only have venison and ground pork… just finished preparing a garden borscht. Im looking for a gluten free recipe for peroghies.